Warning: Serious spoilers are ahead for the Star Wars Rebels season four episodes, "Jedi Night" and "DUME." Jump into hyperspace and away from this page if you haven't watched the episodes yet. Star Wars Rebels is unique in the greater Star Wars universe for myriad reasons. It's enriched mythology and exploration of the Force in ways we haven't quite seen before. The animated series focuses on a family, and not family related by blood, but family that's chosen each other. The show's shown one of the few mother-daughter relationships in the galaxy with Sabine Wren and her mother Ursa. And now, it adds another first: Star Wars Rebels lost a key character in Monday's episode and took the time to face grief and the different ways it can manifest. Leia Organa watched the Empire destroy Alderaan. She had no time to dwell on emotion because of the looming attack on the Death Star. Han perished in The Force Awakens, but characters had to worry about getting away from Starkiller Base and then evacuating the rebel base on D'Qar. I could give more examples, but other than brief or symbolic scenes of grief, we haven't had the opportunity to get up close and personal with loss in Star Wars. Kanan Jarrus, voiced by Freddie Prinze Jr. (I cannot give enough praise for his performance in “Jedi Night”), sacrificed himself to save his family. 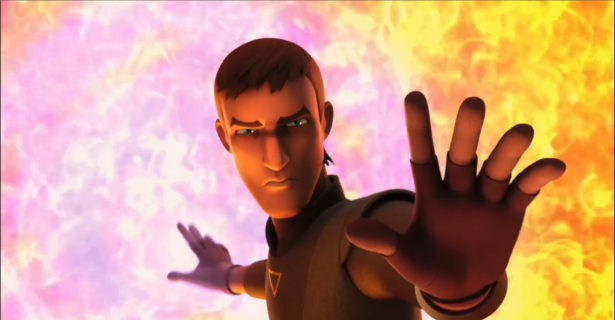 After rescuing Hera from the Imperials, he used the Force to hold back a massive explosion that would have engulfed him, Hera, Ezra, and Sabine. It's the ultimate Jedi act to be so selfless. In Kanan's final look at Hera, he regained his sight. He viewed things clearly. I couldn't see any fear, only determination. It was a heartbreaking but beautiful end for the character who's gone from a reluctant teacher to a wise warrior and mentor. To kill a central character is no trivial matter. Not in Star Wars. We've watched some major characters we've known and loved for decades pass in recent films, sure, but this isn't Game of Thrones—you don't expect a key death every other episode. And, though it's easy for me to forget, Rebels is a children's TV show. That's why it's especially important to see the rest of the Ghost crew react. Kanan's death had a huge impact on his family. That's obvious. I could say so without on-screen evidence because we know they all cared for one another. But we saw every member of the crew process the news. Zeb and Sabine grieved through anger; they wanted to exact revenge upon the Empire, a life for a life. Ezra responded with fear. He lost his teacher and a father figure; he admitted to the loth-wolves he was afraid. Hera was despondent. She'd just told Kanan she loved him; she reacted with sadness and regret and guilt. As the second episode, "DUME," progressed, each character took small steps forward. They honored Kanan's memory by remembering his optimism and his teachings. They were assisted by Chopper (by the way, Chopper taking Hera's hand nearly broke me) and by the mysterious loth-wolves, including one giant one called Dume, which is Kanan's true last name. Kanan's loss is going to be painful for a long time. This is the first personal loss for the group, and given how long they've been fighting the Empire, that's kind of remarkable. This will leave scars on all of them. Nothing about grief is straightforward. It's complex with flowing threads primed for tangles and knots. The feelings can come and go in waves. While we only saw the beginning of how the rebels grapple with their new reality without Kanan, it was impactful, well-crafted, and performed with precision and grace. What do you think of what happened to Kanan? How about the reaction of the Ghost crew? Tell me in the comments. How Mortis is tying into Star Wars Rebels. Dave Filoni on Hera and Kanan's kiss earlier this season. Filoni discusses why Kanan cut his hair.